Thenguzhal is a yummy snack and here is the recipe for it. 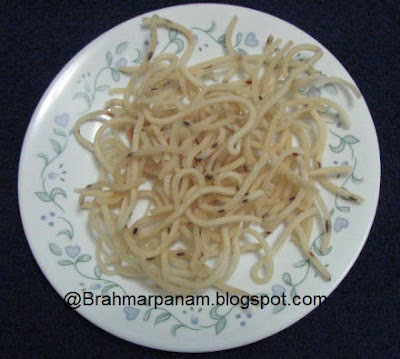 This recipe requires a special instrument called chakli/murukku press. Sieve and mix the rice flour and urad dal flour in a bowl and add the salt, sesame seeds and asafoetida and mix well. Heat Oil in a Kadai/Wok for deep frying. To test if the oil is ready, put a small pinch of dough in the oil and if it sizzles up immediately then it is ready. Add a portion of the dough in the murukku press with the Thenguzhal achu and press it over the hot oil in a circular motion. Place the thenguzhal on a paper towel to drain the excess oil and repeat the process for the remaining dough. Enjoy the crisp thenguzhal as a tea time snack! Store the remaining in a dry airtight container once it is cooled completely. The thenguzhal dough should be mixed and made immediately else they will turn brown. If the oil is too hot the thenguzhal will turn brownish and if it is not the right temperature it will be soggy. So make sure the oil is of the right temperature.